John Keats Ode; to a Nightingale Holly Bost Alise Erdlen. 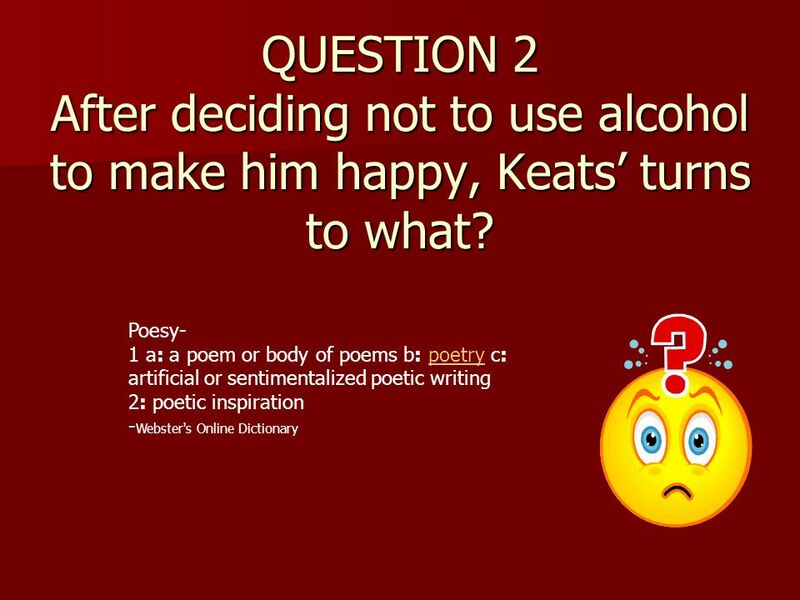 3 HOW TO GET HAPPY: KEATS: Alcohol? 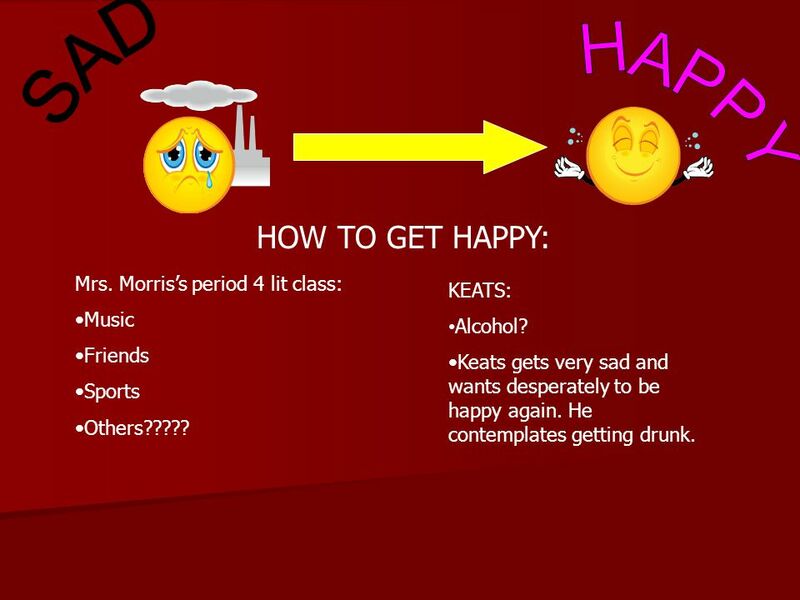 Keats gets very sad and wants desperately to be happy again. He contemplates getting drunk. Mrs. Morris’s period 4 lit class: Music Friends Sports Others????? 6 Fade far away, dissolve, and quite forget What thou among the leaves hast never known, The weariness, the fever, and the fret Here, where men sit and hear each other groan; Where palsy shakes a few, sad, last gray hairs, Where youth grows pale, and spectre-thin, and dies; Where but to think is to be full of sorrow And leaden-eyed despairs, Where Beauty cannot keep her lustrous eyes, Or new Love pine at them beyond to-morrow. Away! away! 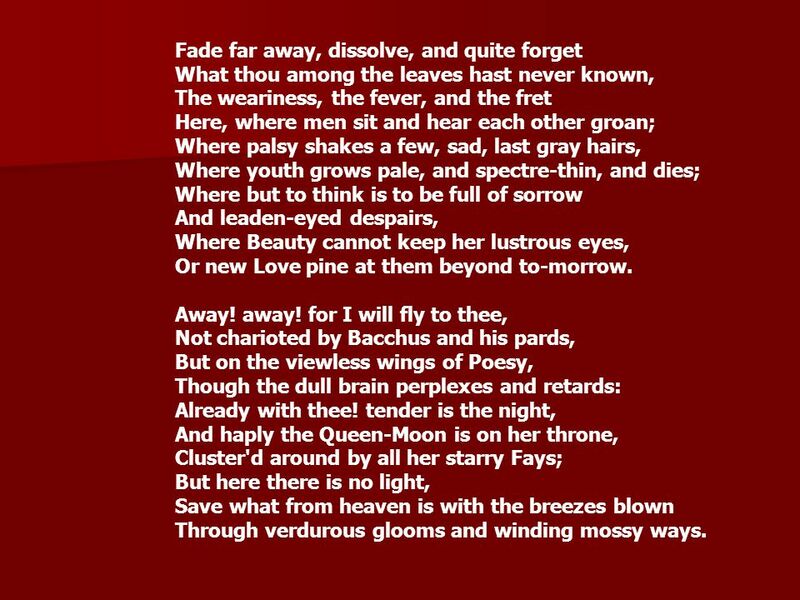 for I will fly to thee, Not charioted by Bacchus and his pards, But on the viewless wings of Poesy, Though the dull brain perplexes and retards: Already with thee! tender is the night, And haply the Queen-Moon is on her throne, Cluster'd around by all her starry Fays; But here there is no light, Save what from heaven is with the breezes blown Through verdurous glooms and winding mossy ways. 7 I cannot see what flowers are at my feet, Nor what soft incense hangs upon the boughs, But, in embalmed darkness, guess each sweet Wherewith the seasonable month endows The grass, the thicket, and the fruit-tree wild; White hawthorn, and the pastoral eglantine; Fast fading violets cover'd up in leaves; And mid-May's eldest child, The coming musk-rose, full of dewy wine, The murmurous haunt of flies on summer eves. Darkling I listen; and, for many a time I have been half in love with easeful Death, Call'd him soft names in many a mused rhyme, To take into the air my quiet breath; Now more than ever seems it rich to die, To cease upon the midnight with no pain, While thou art pouring forth thy soul abroad In such an ecstasy! Still wouldst thou sing, and I have ears in vain-- To thy high requiem become a sod. 9 Poetic Techniques Apostrophe is an exclamatory rhetorical figure of speech, when a talker or writer breaks off and directs speech to an imaginary person or abstract quality or idea. It is related to personification, although in apostrophe, objects or abstractions are implied to have certain human qualities (such as understanding) by the very fact that the speaker is addressing them as he would a person in his presence. In dramatic works and poetry, it is often introduced by the word "O". 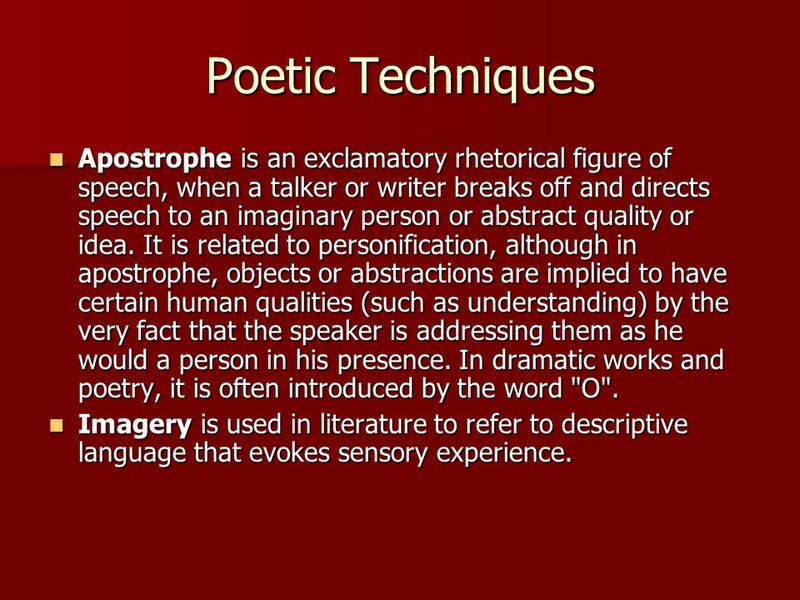 Apostrophe is an exclamatory rhetorical figure of speech, when a talker or writer breaks off and directs speech to an imaginary person or abstract quality or idea. It is related to personification, although in apostrophe, objects or abstractions are implied to have certain human qualities (such as understanding) by the very fact that the speaker is addressing them as he would a person in his presence. In dramatic works and poetry, it is often introduced by the word "O". Imagery is used in literature to refer to descriptive language that evokes sensory experience. Imagery is used in literature to refer to descriptive language that evokes sensory experience. 10 Stanza 1 My heart aches, and a drowsy numbness pains My sense, as though of hemlock I had drunk, Or emptied some dull opiate to the drains One minute past, and Lethe-wards had sunk: 'Tis not through envy of thy happy lot, But being too happy in thine happiness,-- That thou, light-winged Dryad of the trees In some melodious plot Of beechen green, and shadows numberless, Singest of summer in full-throated ease. 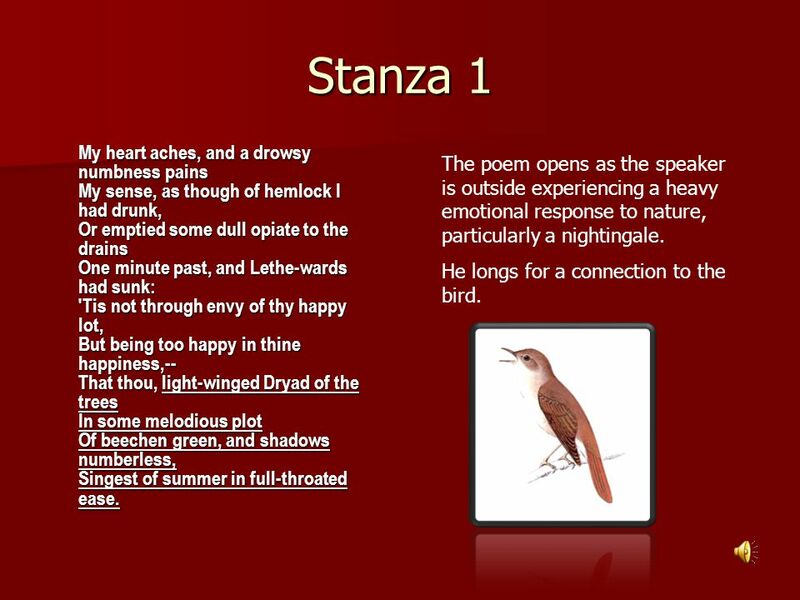 The poem opens as the speaker is outside experiencing a heavy emotional response to nature, particularly a nightingale. He longs for a connection to the bird. 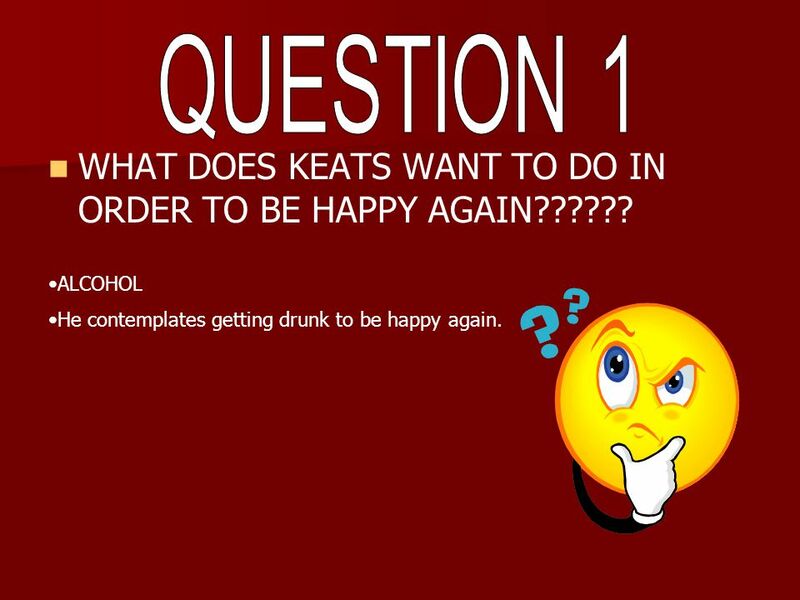 11 WHAT DOES KEATS WANT TO DO IN ORDER TO BE HAPPY AGAIN?????? ALCOHOL He contemplates getting drunk to be happy again. 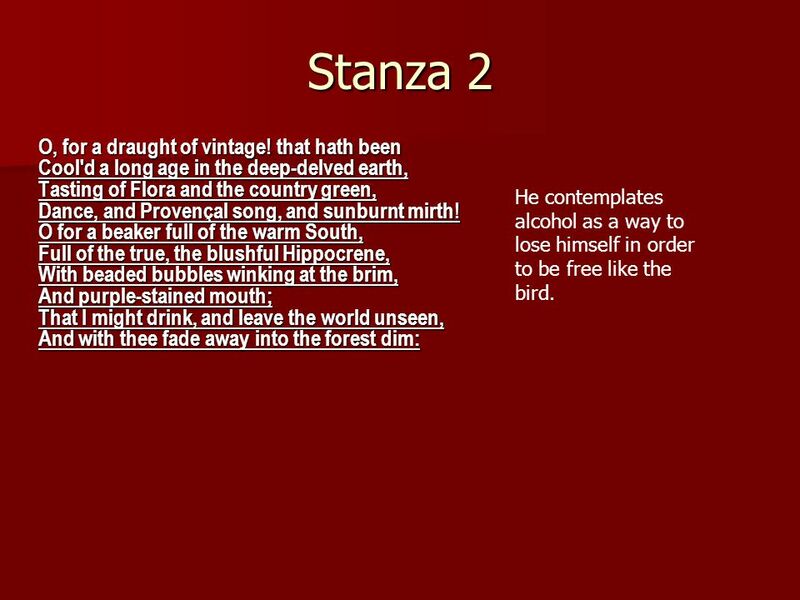 12 Stanza 2 O, for a draught of vintage! that hath been Cool'd a long age in the deep-delved earth, Tasting of Flora and the country green, Dance, and Provençal song, and sunburnt mirth! O for a beaker full of the warm South, Full of the true, the blushful Hippocrene, With beaded bubbles winking at the brim, And purple-stained mouth; That I might drink, and leave the world unseen, And with thee fade away into the forest dim: He contemplates alcohol as a way to lose himself in order to be free like the bird. 13 Stanza 3 Fade far away, dissolve, and quite forget What thou among the leaves hast never known, The weariness, the fever, and the fret Here, where men sit and hear each other groan; Where palsy shakes a few, sad, last gray hairs, Where youth grows pale, and spectre-thin, and dies; Where but to think is to be full of sorrow And leaden-eyed despairs, Where Beauty cannot keep her lustrous eyes, Or new Love pine at them beyond to-morrow. His longing to go with the bird away to the forest makes him pity man. 14 Stanza 4 Away! away! for I will fly to thee, Not charioted by Bacchus and his pards, But on the viewless wings of Poesy, Though the dull brain perplexes and retards: Already with thee! tender is the night, And haply the Queen-Moon is on her throne, Cluster'd around by all her starry Fays; But here there is no light, Save what from heaven is with the breezes blown Through verdurous glooms and winding mossy ways. Away! away! for I will fly to thee, Not charioted by Bacchus and his pards, But on the viewless wings of Poesy, Though the dull brain perplexes and retards: Already with thee! tender is the night, And haply the Queen-Moon is on her throne, Cluster'd around by all her starry Fays; But here there is no light, Save what from heaven is with the breezes blown Through verdurous glooms and winding mossy ways. The speaker reaffirms’ that he wants to escape with the bird. He decides to do this by means of “Poesy”. 16 Stanza 5 I cannot see what flowers are at my feet, Nor what soft incense hangs upon the boughs, But, in embalmed darkness, guess each sweet Wherewith the seasonable month endows The grass, the thicket, and the fruit-tree wild; White hawthorn, and the pastoral eglantine; Fast fading violets cover'd up in leaves; And mid-May's eldest child, The coming musk-rose, full of dewy wine, The murmurous haunt of flies on summer eves. The speaker uses very dark images. 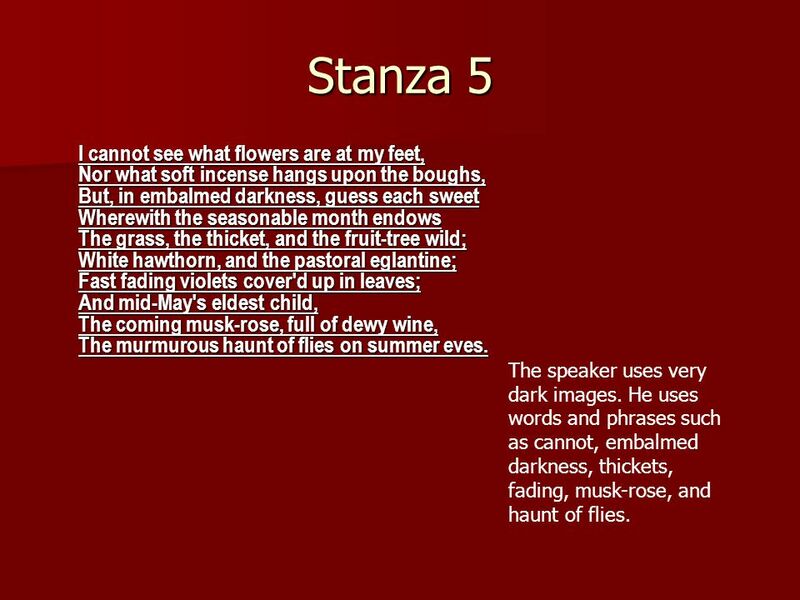 He uses words and phrases such as cannot, embalmed darkness, thickets, fading, musk-rose, and haunt of flies. 17 Stanza 6 Darkling I listen; and, for many a time I have been half in love with easeful Death, Call'd him soft names in many a mused rhyme, To take into the air my quiet breath; Now more than ever seems it rich to die, To cease upon the midnight with no pain, While thou art pouring forth thy soul abroad In such an ecstasy! 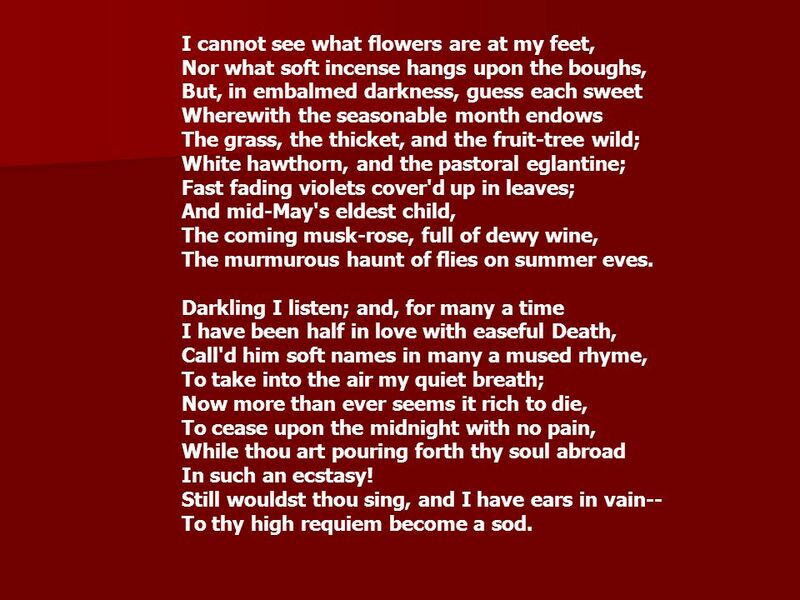 Still wouldst thou sing, and I have ears in vain-- To thy high requiem become a sod. The speaker contemplates death. He thinks that “death retains power only over a living man who is able to fear his own end”. 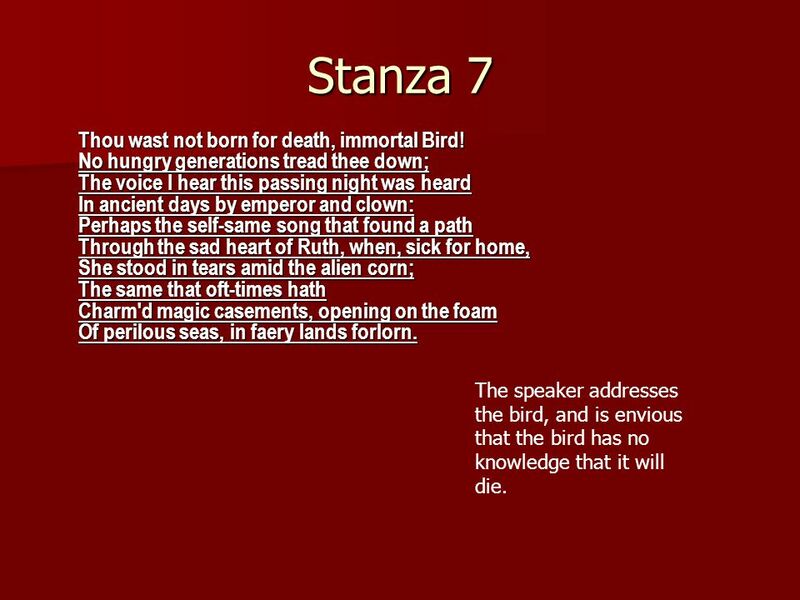 18 Stanza 7 Thou wast not born for death, immortal Bird! No hungry generations tread thee down; The voice I hear this passing night was heard In ancient days by emperor and clown: Perhaps the self-same song that found a path Through the sad heart of Ruth, when, sick for home, She stood in tears amid the alien corn; The same that oft-times hath Charm'd magic casements, opening on the foam Of perilous seas, in faery lands forlorn. The speaker addresses the bird, and is envious that the bird has no knowledge that it will die. 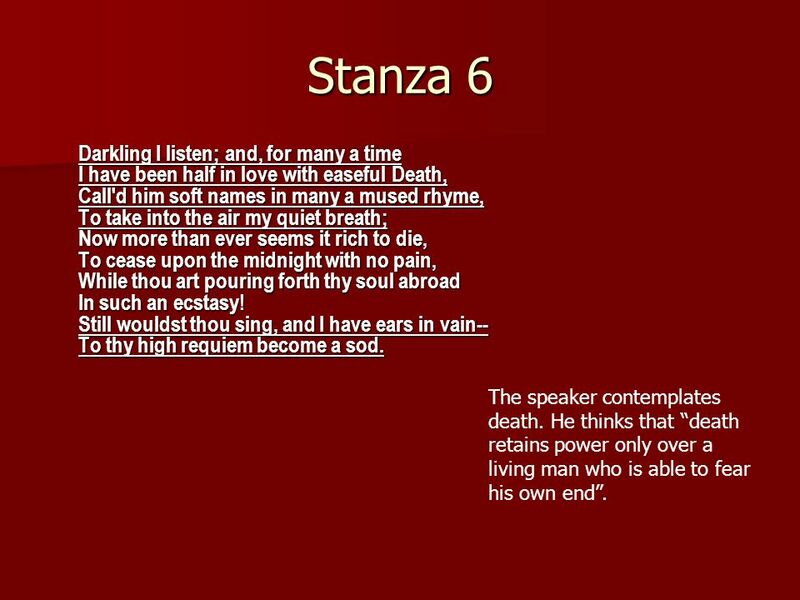 19 Stanza 8 Forlorn! the very word is like a bell To toll me back from thee to my sole self! Adieu! the fancy cannot cheat so well As she is fam'd to do, deceiving elf. Adieu! adieu! 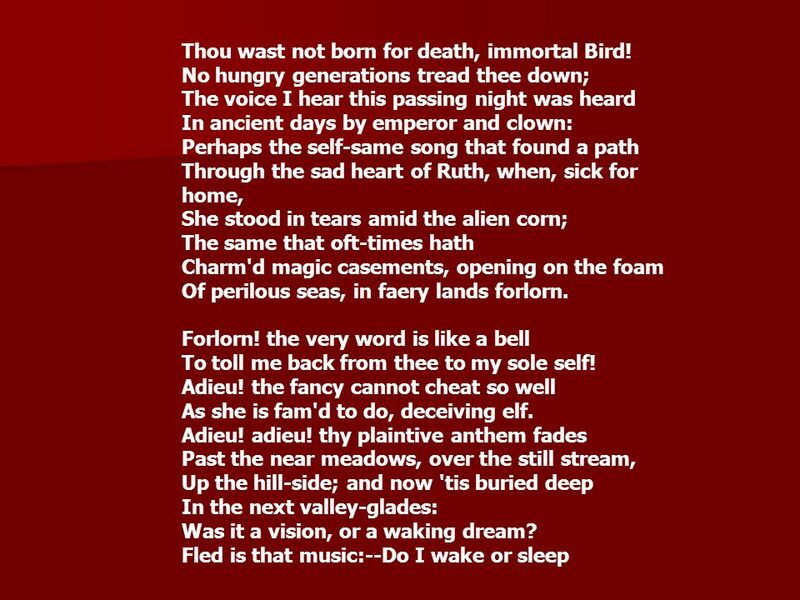 thy plaintive anthem fades Past the near meadows, over the still stream, Up the hill-side; and now 'tis buried deep In the next valley-glades: Was it a vision, or a waking dream? Fled is that music:--Do I wake or sleep? The speaker’s fantasy about escaping with the bird ends and he leaves the audience with questions. 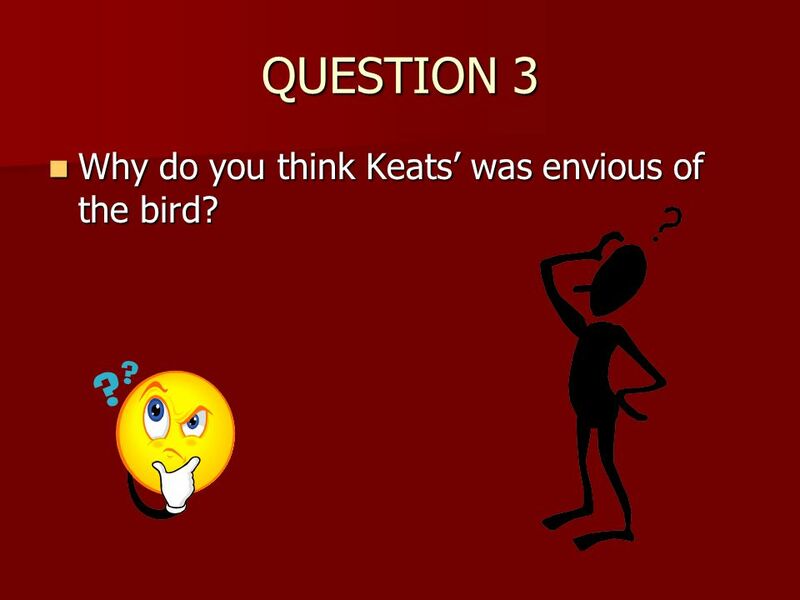 20 QUESTION 3 Why do you think Keats’ was envious of the bird? Why do you think Keats’ was envious of the bird? 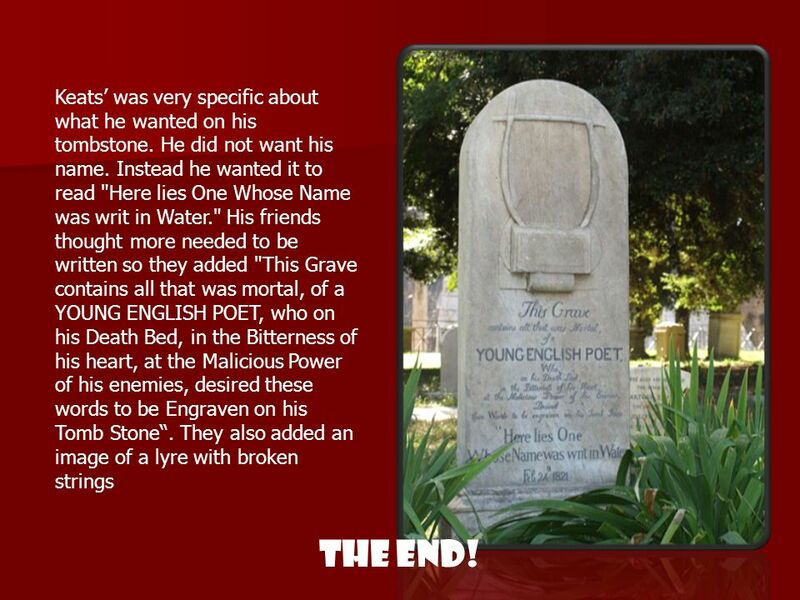 22 Keats’ was very specific about what he wanted on his tombstone. He did not want his name. Instead he wanted it to read "Here lies One Whose Name was writ in Water." His friends thought more needed to be written so they added "This Grave contains all that was mortal, of a YOUNG ENGLISH POET, who on his Death Bed, in the Bitterness of his heart, at the Malicious Power of his enemies, desired these words to be Engraven on his Tomb Stone“. They also added an image of a lyre with broken strings THE END! 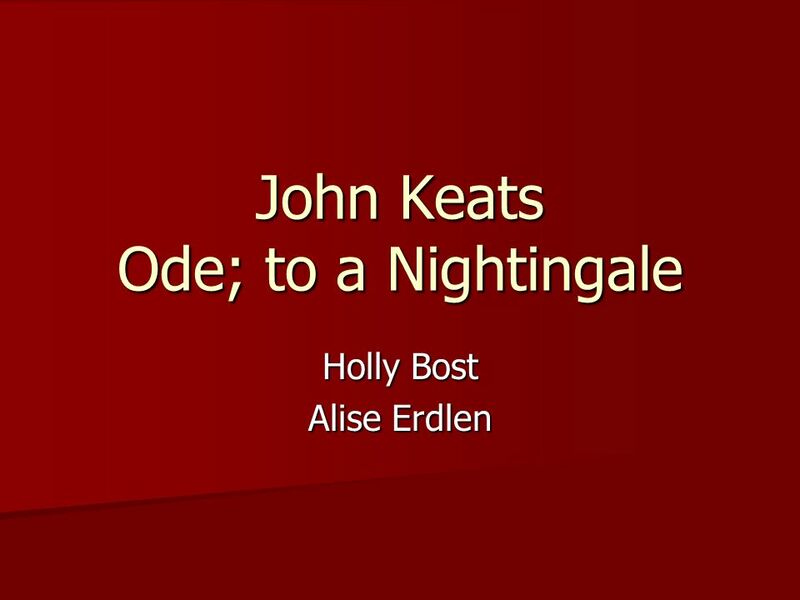 Download ppt "John Keats Ode; to a Nightingale Holly Bost Alise Erdlen." Cynthia “The moon goddess” A Thing of Beauty John Keats. 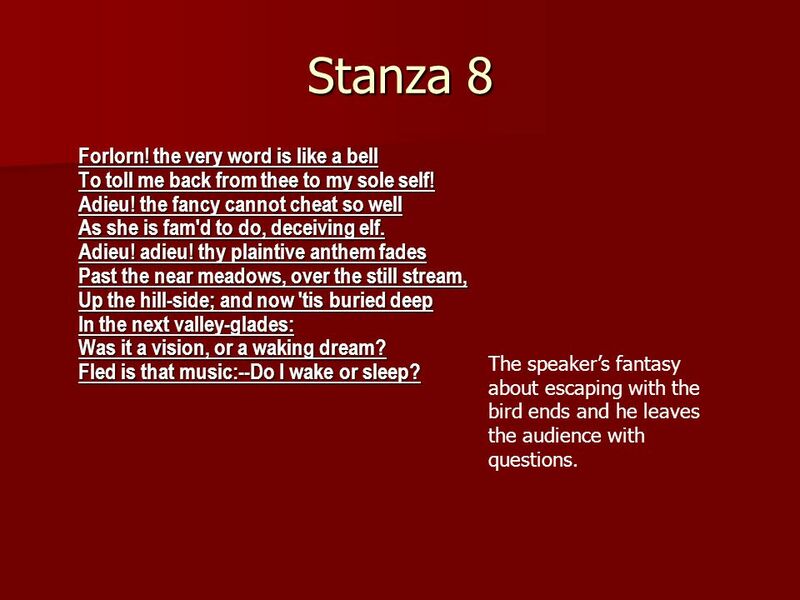 Ode on a Grecian Urn John Keats Lecture 14. 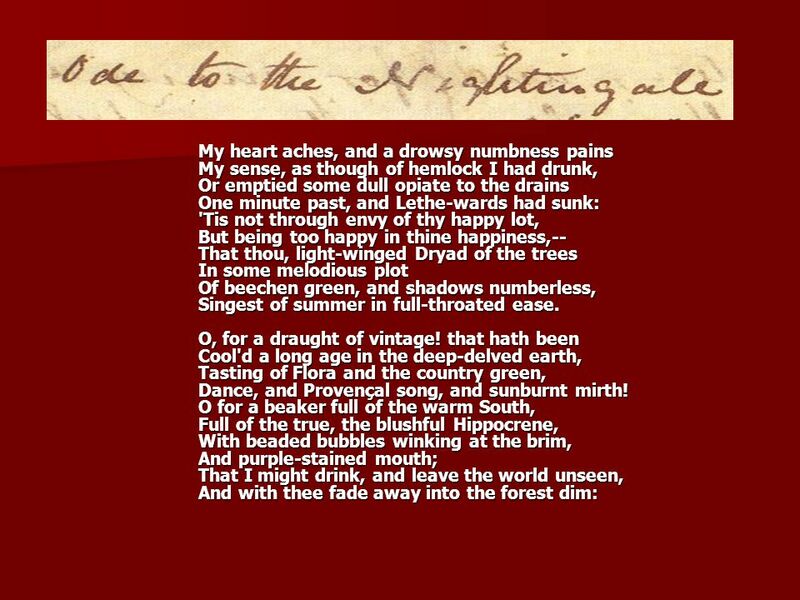 Ode to a Nightingale By: John Keats. English Romanticism The Romantic Imagination. Blake: A Vision of the Last Judgment (1810) This world of Imagination is the World of Eternity; it is the. 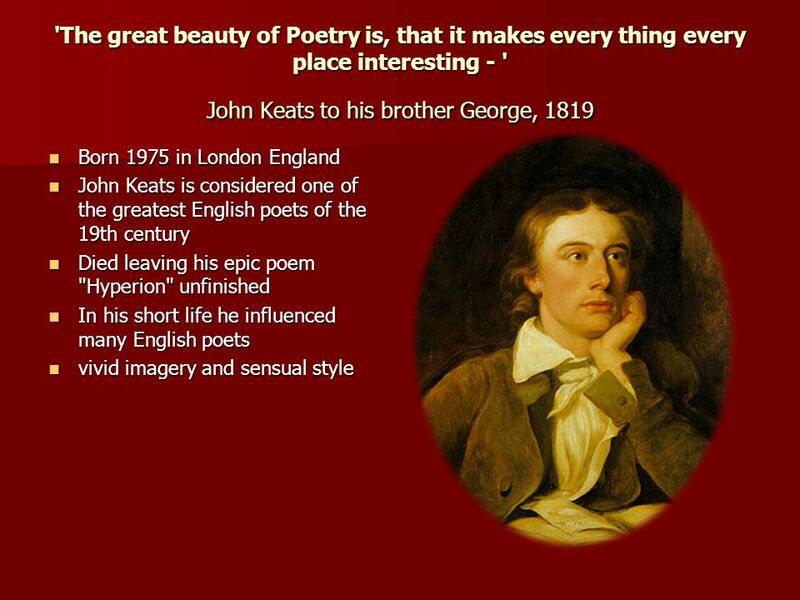 John Keats 1795 – 1821 Trained as a physician Gave up medicine for poetry Died of Tuberculosis. ODE TO A NIGHTINGALE John Keats, read by Benedict Kumberbatch. 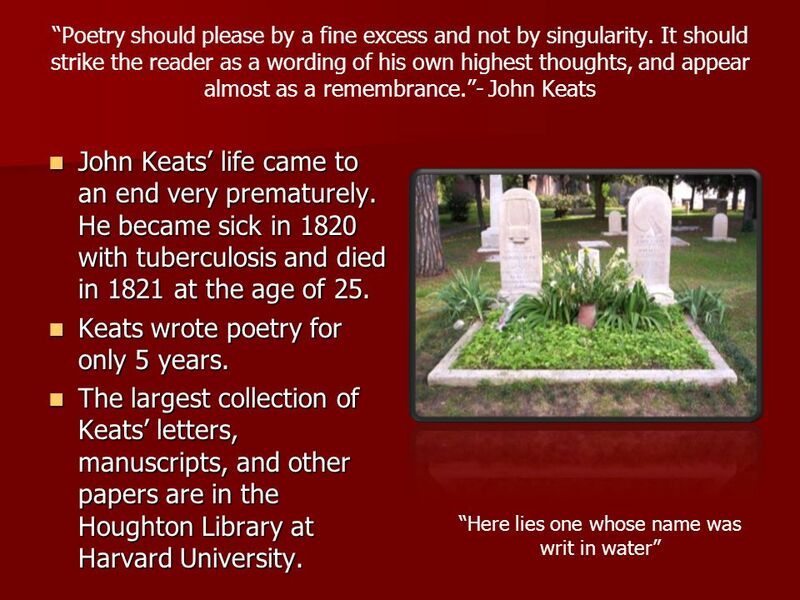 John Keats -John Keats ( ) was born in England as the oldest of four surviving children, died of tuberculosis at age 25 -His father fell off a.
Ode to a Nightingale John Keats Lecture 15. Rain Edward Thomas 1878 – 1917 Laura Botha Freddy Rouget. Shakespeare’s Splendid Sonnets Jenny Cho English C Block 8/26/08. Device Examples $100 $200 $300 $400 $500 Poetry Styles Shakespeare’s Poetry. Integrating Skills Reading, listening and writing SONGS AND POEMS Why read, and sometimes even write poetry? That question is not difficult to answer if.